On October 7, 2011, Flemington, NJ's Richie Knucklez catapulted himself into the video game record books by racking up 110,510 points in the original 1978 arcade hit Space Invaders, more than doubling the previously held record. How did he do it? Owning his own arcade certainly didn't hurt. Richie Knucklez Arcade Games isn't just a New Jersey institution; it's a place where video game legends go to make their names. 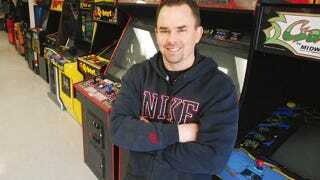 It's where veteran professional gamer Steve Sanders set the tandem record for Joust with his son last year. Where some of the most famous arcade gamers converged this year for the Donkey Kong Kong-Off. Now it's home to the highest score Space Invaders has ever seen. Knucklez generated the 110,510 points on October 7, the score verified by the record keepers of Twin Galaxies, the accepted authority on all things video game record-related. The previous record, set back in 2003 by classic gaming champ Donald Hayes, was only 55,160. It also didn't hurt that Knucklez learned some moves from Hayes himself. "He and I played together a few times and he showed me some good techniques that I tweaked," Knucklez said of Hayes. "He taught me the basics with counting the shots for 300 points and I tweaked it in a way that I could score at a faster rate." Already a record score holder for several games (Phoenix and Space Fury) the Space Invaders crown is Knucklez's biggest achievement yet, but he's not planning on stopping there. Richie's next stop is the Twin Galaxies Video Game Festival in Ottumwa, Iowa, where he'll be taking Space Invaders into the Iron-Man endurance contest, despite the game's well-documented kill screen bug. That's a ballsy move, but I'd expect nothing less from Richie Knucklez, defender of the Earth.